Your kit comes with 2 Base Strips & 2 Traction Pads. You lace the Base Strips onto your shoes once and they stay on your shoe. The Traction Pads slide onto the Base Strips for use and off the Base Strips for cleaning. Firmly squeeze both side tabs with one hand and use the other hand to slide the Traction Pad off the Base Strip. 1. Remove the laces from your shoe, leaving just the bottom lace still in the eyelets. 2. Hold the Base Strip with the arrow on the surface of the Base Strip pointing to the toe of the shoe. (The end with the raised rails goes closest to the toe) Pass each lace through the farthest outside opening of the bottom Securing Band. Continue lacing like you normally would. When you pass through the lacing eyelet on the shoe that is even with the top Securing Band, pass the laces through the farthest opening, and continue lacing as normal. 3. The Base Strip should now be secure and flat on the laces of the shoe, with the rails on top. You can move the Base Strip up and down on the laces by starting higher on the laces. The Base Strip stays on your shoe permanently. Always keep the rails clear of any debris. Open the spout on the bottle of Court Grabbers® Traction Gel. While holding a Traction Pad in one hand with the cloth facing up, or directly to the Traction Pad secured to the shoe, tilt the bottle and gently apply three light lines of Traction Gel the length of the Traction Pad. The length of the Traction Pad cloth should be slightly moist, never “wet”. Never apply more than 3 light lines of gel. If your Court Grabbers® are losing effectiveness, use the next break in action to reapply the Traction Gel. With practice, you’ll be able to do this while the Traction Pad is on your shoe. Always apply Traction Gel off the court. Slide the Traction Pad onto the Base Strip, (narrowest end of the cloth slides in first) Make sure that the lip slides into the rails on the side of the Base Strip, and locks in place. You will hear a slight “click” when the two tabs are correctly secured in the openings of the rails. Wiggle the Traction Pad to make sure it’s securely locked in place before using Court Grabbers. Before entering the court, lightly wipe the bottom of each shoe across the Traction Pad of the opposite shoe. To renew traction while on the court, lightly wipe your shoes on the opposite Traction Pad and you’ll instantly restore fresh, high performance traction. *When the Traction Pad dries and is not restoring traction, applying 2 light lines of Traction Gel will restore the pad’s effectiveness. Court Grabbers were developed as a “system” and must be used as instructed, together, to be effective. Do not use the Traction Pads without the Traction Gel. Doing so will cause the cloth to fray and greatly reduce the effectiveness. NEVER USE WATER IN THE TRACTION PAD! Water is very dangerous on a court and we went to a great deal of effort to make sure our Traction Gel delivers the best traction in the World! For the first use, apply Traction Gel only to one Traction Pad. This provides instant feedback to how effective this equipment is as you’ll have one clean shoe & one dirty. You’ll hear and feel the difference! *Keep your Court Grabbers clean. This is the most important thing as they will become full of dirt and dust and must be cleaned to be effective. Remove the Traction Pad every 3-4 uses and toss in the washer and dryer with your practice/game clothes. You just pinch the tabs on either side and slide it off the Base Strip. Any “fraying” or “pilling” of the cloth will usually go away once the Traction Pad is washed. *Laces: Keep the laces off the Traction Pads by either double tying them or replacing with shorter laces. Long laces do absolutely nothing for your game, traction does. So make the adjustment to play better and safer. 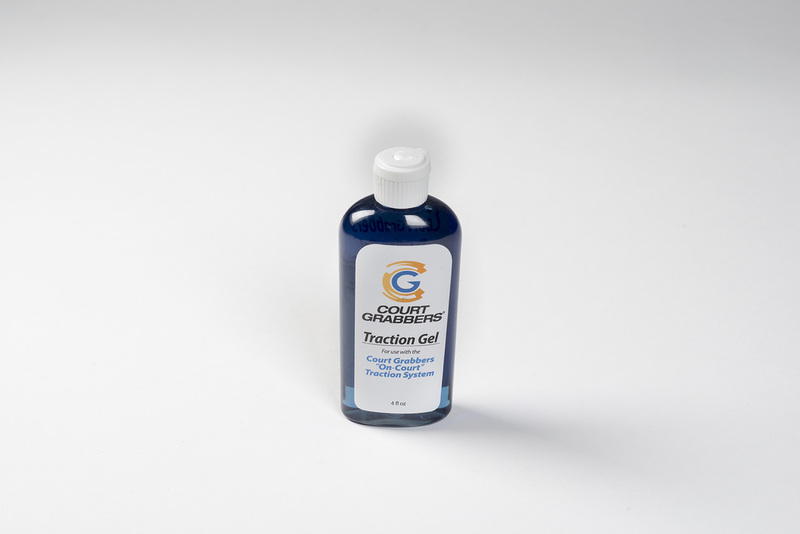 *Traction Gel: Traction Gel has no harmful effect on the user, shoes, clothes, or the court. You can find an independent lab certification on the Compliance page on our site. This certifies our Traction Gel is safe for all courts. Always use the least amount necessary to obtain the best result. More gel does not equal more traction. *Compliance: You will find compliance letters from the NCAA and National Federation of High Schools on our Compliance page of our site. The basketball rules committee of the NFHS declared our equipment “Permitted for Play” in 2012. We have conferred with numerous senior volleyball officials as well and all agree Court Grabbers are within all equipment regulations. *Base Strips: To easier accommodate using Court Grabbers on several pairs of shoes, simply purchase an extra set of Base Strips for each pair of shoes. Use the same Traction Pads for all your shoes, or buy different colors to mix and match. *Use your Court Grabbers for at least one practice to get used to how they work and how much Traction Gel you need for different conditions. To have the best traction possible, in addition to using your Court Grabbers, at least once a week, and certainly before games, scrub the bottom of your shoes with a scrub brush and water and dish detergent. You’ll be amazed at what the combination of these two things does for your game and the life of your shoes! Play better, healthier and safer with Court Grabbers!